What is a Vented Van? 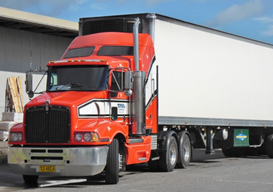 There are a wide, wide variety of truck and trailer types available for commercial and residential use. It’s quite easy to become overwhelmed if you don’t understand the function of each type of trailer, and choosing the wrong one could be detrimental to your goods, depending on their nature. Today, we’re focusing on the vented van, but first, let’s become familiar with a regular van. 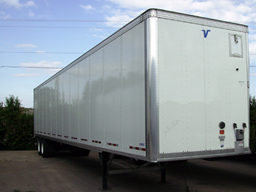 In the shipping industry, the term ‘van’ refers to the trailers we so commonly see attached to a semi truck. They are most commonly called ‘dry vans’, because they haul dry and usually non-perishable goods. Vans are one of the most useful tools in the shipping industry, due to the fact that they protect goods from the elements and can haul a wide variety of items. So how are vented vans different from regular vans? In reality, it’s pretty simple. Vented vans are vented in both the rear and the front of the trailer, which allows for air flow. The air flow enables vented vans to haul goods that may otherwise require a reefer truck. In the image below, you can see the small door in the top right corner. This is a vent that is able to be open or closed, which is great when it’s raining or snowing and the particular goods inside at that moment could be damaged due to moisture. Some vents also look like ordinary heating/air conditioning vents, with slits in a piece of metal. Vents cut down on the build up of heat and fumes from the products trailers are carrying by keeping them cool and ventilated. There are records of drivers passing out when opening the back of their unvented trailers while hauling onions due to their strong fumes. Vented vans eliminate that risk, and allow goods to breathe. If you’re interested in a vented van, or another van type for your shipment, Freight Rate Central is here to assist you. You can view our variety of truckload trailer types and contact us to set up your shipment or have any questions answered.